The Ravenheat CSI 120 32kW is a condensing gas combination boiler that has been designed to reduce NOx levels to the lowest of those seen in current boiler models - well below the current range of UK regulated levels. This environmentally friendly design also means that its friendly on the pocket - reducing energy bills by around 35%. It's also extremely compact - likely to be the most compact boiler available on the current market with such a high heating and water output. It's dimensions are only 700mm by 400mm by 300mm deep. Its output is excellent - over 25 kilowatts for central heating and 32 kilowatts for on-demand hot water. It also has highly technological features such as a fully programmable seven day timer/programme guide and all the controls can be easily accessed under the easy-lift door. It can provide high volumes of hot water too - over thirteen litres a minute raised at 35 degrees C.
It also has a fully modulating fan and burner and neat valves as well as the patented heat exchanger. It's very easy to install - with a plastic 'push-fit- flue' which can be easily fitted with the ready attached casing clamp and colour coded parts to make it easy to fit. These features mean that its very easy to maintain. 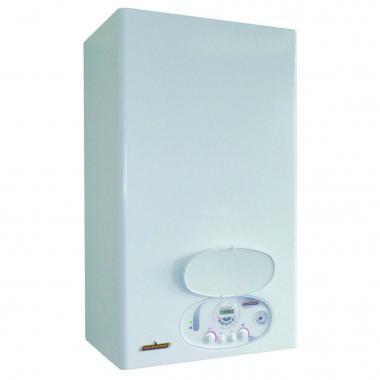 This boiler is recommended by the Energy Saving Trust.